If word of mouth marketing is the best sort of marketing, using reviews and testimonials is the second best! They basically pump up your word of mouth. Now somebody is talking not only to the people they know, but also to other people about your business. Let’s look at how you leverage reviews and testimonials effectively to get the most value out of them. Let’s start with reviews and testimonials that you ask for and that you own and control. A leaflet that you are dropping around in a particular area. Something you leave in a presentation package when you have visited people. Something you put in your proposals. Occasionally someone who gave you a review may even be willing to be called. In which case, by all means add that in there, because that’s brilliant. You also want to use all of your reviews on your website. So, if you have enough reviews or testimonials, create a page, called ‘Reviews’, ‘Testimonials’ or ‘Customer Feedback’. Include it in your ‘About Us’ menu or in your ‘Our Clients’, or even ‘What Clients Say’ menu depending on how you’re structured. But please don’t relegate all your testimonials and reviews to a page that people have to search for. You want everybody to know about them, not just those people who are actively wondering what everyone else says about you. Start off by putting some on your home page. Almost certainly your home page is the most travelled, most visited page on your site. So put a couple on there. Pick some really nice ones. Ones which apply to more than one service. Or to the service you most want people to ask about. Place a link at the bottom of this review section.that says: ‘See More Testimonials’ or ‘See More Customer Comments’. This leads through to your dedicated page. If you have a range of services and reviews which are specific to particular services, another great place to put these reviews and testimonials is on your service pages. Just be consistent. If you put a review on one service page, you should put something on each of them. Make sure that you leverage reviews specific to each service, or ones which addresses the pain points associated with that service. That means that you cannot leverage reviews in your printed marketing material, or on your website, or any social media that you own! If that is the case for you, then try to encourage those people to leave reviews on public sites, in public arenas where you’re not controlling them. Even if you can have reviews on your site, it’s still a good idea to encourage reviews on other sites. Why? If a review’s on your site, people may think you wrote it yourself. When they see it on a third party site, that’s less likely. So they have a higher level of trust. If someone sees a review while they are searching, it may encourage them to visit your actual site. So you can drive traffic to your site. The obvious one is Google, on your Google My Business listing. If you haven’t got your my Google business listing, get it now! If you’ve got a Facebook page, you may also get reviews on there. There’s also a wide range of review sites. Most Australian review sites are for consumers. Some are generalist and some are industry-specific. I have separated them out. If your customers are other businesses, it may be more difficult to find a good review site – except the international software ones. The ‘rankings’ are an indication of how popular and respected the sites are. Higher numbers are better. In my experience, Moz is sometimes a bit US-focussed, whereas Ahrefs is more global. If you know a site I have missed, please let me know! https://www.wordofmouth.com.au/ 78 52 womo.com.au also redirects here. https://www.productreview.com.au/ 77 71 Primarily product focused but some service categories too. https://www.autoguru.com.au/ 39 29 Also offer a service where consumers request a quote. You’ll need to decide where to go for your particular business and your particular industry. I would generally suggest you aim for reviews on Google plus one other site. In some cases you may need two targets other than Google. So you know why you want reviews and testimonials. Now, how do you get them? First of all, don’t be afraid to ask. Second, look for opportunities to ask. When you’re delivering a service, you are top of mind. That’s the time your clients are most likely to be engaged. Do the following opportunities apply to your business? Put the same request on receipts if you provide those. If you work on a project basis, you could run a customer satisfaction survey at or just after completion. It’s one of the commonest uses of surveys, Surveys are an absolutely great place to ask people what they think about you. If they say something nice, then get in touch. Thank them and ask if you can use the testimonial publicly. Remember, if there are certain sites where you want people to leave reviews, let them know which sites matter to you. Where possible, create a direct link so that they can go straight to the site and leave a review. Here’s how you create a link for people to review your business on Google. So now you have some reviews. How do you get the maximum value out of them? The first thing you need is a system to track reviews of your business. Depending on the sites relevant to you, you may be able to register for automatic notifications of new reviews and comments. That’s ideal – you just respond when you receive a notification. Alternatively, you might need to set yourself a monthly or bi-monthly reminder to check for new reviews on your chosen sites. If you get good reviews, are you allowed to then quote those good reviews from external sites on your own website? Check the conditions of the original site where the review was posted! They may or may not let you quote them. If there’s none that you can quote on your site, then on your testimonials page say ‘Check out our other reviews on these sites‘ and provide links to those sites. Preferably directly to the page about you. (Don’t do this if all your reviews are bad, of course! But I’m assuming that you deliver great services. You may also be able to quote from your reviews in Google Ads (the new name for Google Adwords). It has review extensions which will pull through reviews, and show them with your search ad. It only works for reviews from approved and certified third-party sites. If you have really good reviews, it’s worth investigating. Don’t just leave them there and think, ‘Oh, that’s nice.‘ Say thank you. It makes you look responsive. It shows you care and it makes the person who reviewed you feel good. You are going to get bad reviews, and you are going to have to deal with them! 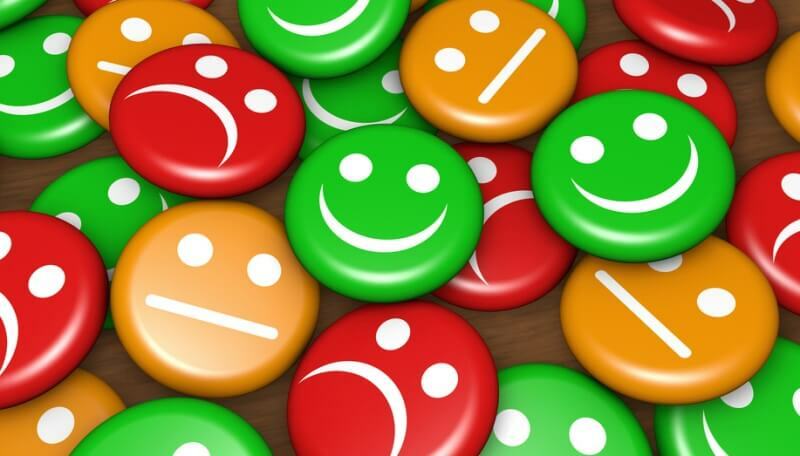 In fact, there are good reasons to be happy about negative reviews. Don’t freak out! Everybody gets bad reviews. Nobody is popular with everyone. If you’re a hundred percent perfect, it looks suspicious…It doesn’t look normal. Maybe it’s rigged? Have you ever looked at something and said, ‘Yeah, it’s too good to be true, I don’t believe it.‘ But if you’ve got five good reviews and one mediocre review, then you look more normal. Never, EVER ever respond negatively about the person posting the review. It doesn’t really matter what the person posting the review is like. What matters is that lots of people who have never seen you are going to see how you deal with criticism. You want to look like you can take it on the chin and deal with it well. Respond. Don’t ignore it. But when you respond, remember it’s not negative. Start with some empathy. Whatever the rights and wrongs of the case, someone is unhappy. Then think about how you can make things better. Can you explain what went wrong and can you fix it for the future? Then acknowledge that you had a problem, apologise, explain what you’ve done to stop this happening again. It depends what platform you’re on at the time. But take it away from the public environment to sort it out. Don’t slag off your own staff. If one of your team did something wrong, try to be kind. They were new to the job, still learning. They made an honest mistake. ‘We’re working to rectify this issue.‘ ‘We’re always trying to make things better‘. Those are kind of the things that you want to say. So there you go. It’s really quite simple. Do what you can to get reviews. If you can’t get them on site, get them off-site and everywhere else. When you get them, use them. Always be nice to people who are nice to you. Always be polite to people who are not so nice about you, as well.